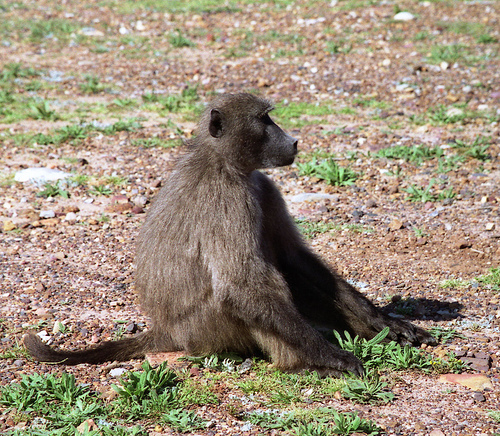 Take 10 minutes and listen to Barbara Smuts talk about becoming a shy baboon. She becomes baboon by sitting like one (see picture above); she corrects her interviewer’s boarish imitation of a baboon by properly snorting, lip-smacking, and snuffling, briefly confusing those of us who had tuned in to hear only Barbara Smuts, human; as she tells it, although a vegetarian, she salivates when she looks on as the baboon troop dismembers a young gazelle; and when she takes shelter from a storm in a fisherman’s hut and discovers it thronged with baboons, she remains with them. we are so used to this dividing line. There’s humans on one side, and then there’s all the other animals on the other side, and we don’t meet up. But if you go back in evolutionary time, that line wasn’t there. So, rather than feeling like I was stealing something, it felt like I was retrieving something that was my heritage. It felt so completely natural to just be with them, to not be doing anything, to just be. You should be able to identify where I would apply pressure–back in time, completely natural, just–as if the vegetarian scholar Smuts is less natural than the baboons, as if the “heritage” (which includes a heritage of dismembering others) is not all around us, all of us, now, depending on how we allow ourselves to sit, depending on how we allow ourselves to be sat with. But I don’t want to grouse much. Have a listen, get hooked on Radiolab, and let me know in comments, if you like, what you think I should listen to. This entry was posted in General Culture, MedievalBlog and tagged animals, critical animal theory by medievalkarl. Bookmark the permalink.